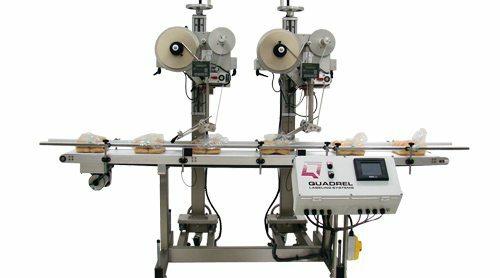 Quadrel’s food grade labeling systems are ideal for prepared foods, clamshells, tray packs, etc. Additionally, we offer systems for labeling condiments, steak sauce, pancake syrup, salsa, etc. Design features such as 316 stainless steel construction, TENV (Total Enclosed Non Ventilated) motors and food grade belting comply with FDA requirements. 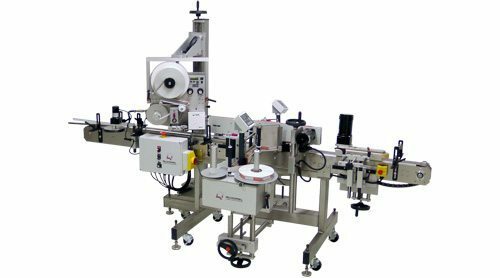 This high-quality system features a top-mounted label applicator. 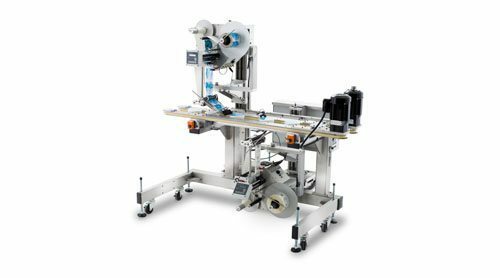 This equipment is capable of applying a 3-panel label to shrink-wrapped packages of pasta or other prepared foods. 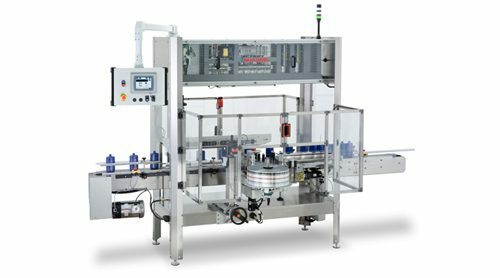 Dual redundant applicators with automatic crossover provide non-stop labeling of leading top and bottom panels on clamshell containers. This system is controlled by Allen Bradley PLC. This economically priced labeling system applies top and wraparound labels to plastic, tapered containers at speeds up to 60 ppm and features Allen Bradley PLC control and color touchscreen operator interface. This custom system is designed specifically for the irregular surface of poultry packages. This system is very heavy duty, features PLC control, color touchscreen and 304 stainless steel construction, necessary in a food environment. 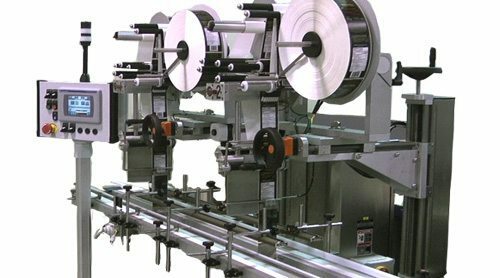 The ProLine labeling system is designed for the most demanding environments. It is particularly well-suited for food environments, featuring overhead mounted electronics and 14-inch clearance below, making cleanup easy. This custom labeling system is designed specifically to apply bottom labels on clamshells or other prepared food containers. Ideal for use in bakeries, meat packagers, etc. Additional features include all stainless steel construction, PLC control and color touchscreen. 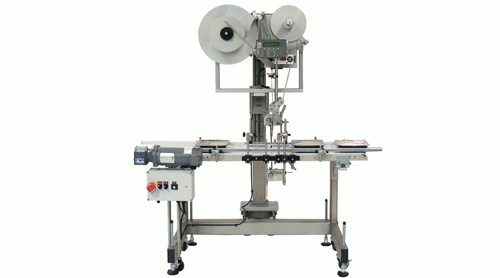 This labeling system is ideal for pre-packaged food containers such as clamshells, and shrink-wrapped packages. 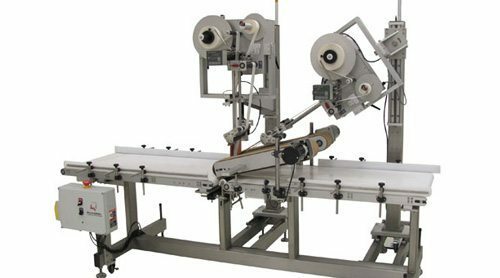 This system also features a bottom-mounted wipe-on applicator and a split rubberbelt food-grade conveyor. 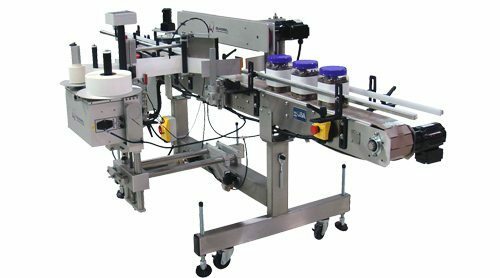 This three panel labeling system uses “saloon doors” pneumatic rotary actuators to apply labels to the leading edge and down the sides of square or rectangular shaped containers. Features include all stainless steel construction and PLC control. 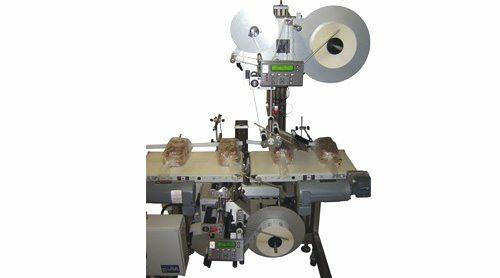 This zero downtime labeling system provides non-stop operation, and is ideal for labeling the tops of clamshells, baked goods and other prepared foods. Features include sealed electronics and 304 stainless steel construction necessary for food environments. 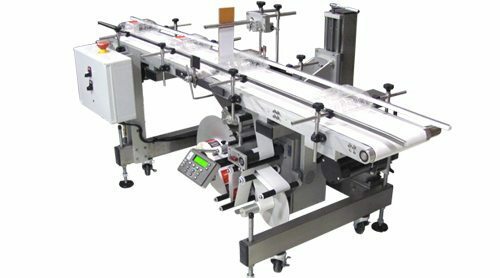 This top/bottom labeling system utilizes hugger-belt technology to suspend the product, allowing simultaneous top and bottom labeling at speeds to 100 products per minute. 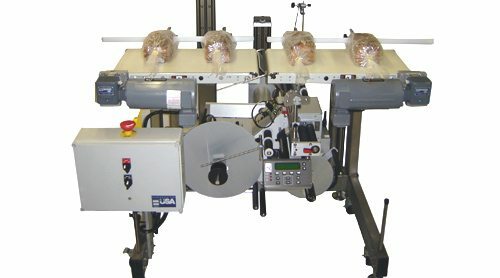 This top/bottom labeling system uses split belt technology to apply labels to the tops and bottoms of clamshells and other prepared food containers. Speeds up to 100 ppm are possible.